Millions Affected, Why Isn't This Menstrual Condition Studied More? Are cancer drugs too expensive? Maybe. How can a condition that may afflict one-tenth of all women, and whose well-known victims include Susan Sarandon, Whoopi Goldberg, Padma Lakshmi, Dolly Parton, Anna Friel and maybe even Marilyn Monroe be so poorly studied and little known? Endometriosis is the condition in question. 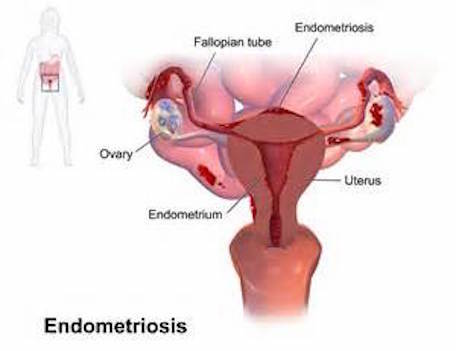 Endometriosis occurs when tissue similar to the lining of the womb (medically, the uterus, whose lining is termed endometrium) is found elsewhere in the body like in the abdomen, ovaries, bladder, and bowel and bleeds every month. The condition, especially when un- or mis-diagnosed (all too commonly), is responsible for a massive social cost in broken marriages and depression, as well as being a huge economic burden, partly because of the large number of women who have to drop out of the workforce. Endometriosis is especially common among women in their 30s and 40s. The most common symptom is pain, at the time of periods but also in-between, often with bleeding (medical term:menometrorrhagia). Sadly, still, women are told periods are supposed to hurt, and that it s a woman s lot in life to suffer. Dr. D Hooghe s team carried out laparoscopies on 221 infertile women who had no obvious symptoms, without previous surgical diagnosis for infertility. Almost half of them had endometriosis and 40% of those had stage-3 and stage-4 disease. The authors concluded that endometriosis may be a huge, often unrecognized factor in infertility. Even getting a diagnosis is difficult. Doctors are often unaware of the disease, while specialists are often ill-informed. That means women can suffer for years before the disease is confirmed through a laparoscopy. Some chronic sufferers become dependent upon painkillers. Researchers are investigating the genome of women with the disease and say about 50 percent of endometriosis is inherited. Extended-cycle (only a few periods a year) or continuous cycle (no periods) birth control. These types of hormonal birth control are available in the pill or the shot and help stop bleeding and reduce or eliminate pain. Intrauterine device (IUD) to help reduce pain and bleeding. The hormonal IUD protects against pregnancy for up to seven years. But the hormonal IUD may not help pain and bleeding due to endometriosis for that long. For women who are trying unsuccessfully to become pregnant, a gonadotropin-releasing hormone (GnRH) agonist medication may be prescribed. This medicine stops the body from making the hormones responsible for ovulation, the menstrual cycle, and the growth of endometriosis. This treatment causes a temporary menopause, but it also helps control the growth of endometriosis. Once someone stops taking the medicine, her menstrual cycle returns, but she may then have a better chance of getting pregnant. For some women, the painful symptoms of endometriosis improve after menopause. As the body stops making the hormone estrogen, the growths shrink slowly.